The leadership in Minsk seems to be taking advantage of the crisis in Ukraine to improve its image. Relations between the West and Belarus have taken a curious and intriguing turn over the last several months. High-level European officials have been traveling regularly to Minsk to participate in conferences, summits, and meetings. Just a year ago, it would have been difficult to imagine Dunya Miyatovich, the OSCE’s Representative on Freedom of the Media, visiting Belarus. But not only has Miyatovich gone to Minsk, she has noted progress in the attitude of the Belarusian authorities towards the freedom of the non-state media – even though journalists were being detained and arrested during her visit. An official delegation from the United States government also went to Minsk in September, and the Council of Europe held a seminar there. Belarus and the West had very little contact for many years, and the authorities in Minsk were quick to nip discussions of problems like the freedom of the press and democratic values in the bud. Now, both Miyatovich and members of the American delegation said these and similar subjects were raised at their meetings in Minsk. Of course, this change of heart is certainly no accident. Nor is it the result of changes in Belarus’ domestic policies, as there have been no major alterations there. Rather, attempts to normalize relations between the West and Belarus are a direct consequence of events that happened not in Belarus, but in neighboring Ukraine. As early as March, Belarusian President Alexander Lukashenko started to position Belarus as a neutral country, offering it as an intermediary in the conflict erupting between Russia and the West. Militarily, Minsk could not have played a role in mediating the conflict. The country was unlikely to have gotten a UN mandate for a peacekeeping operation and regardless, Belarus has a peacekeeping force of just 30 people. But over the past few months, Minsk has quietly positioned itself as a political intermediary, and this signal that Belarus is not necessarily on Russia’s side has been heard and appreciated. Against the backdrop of the crisis in Ukraine, the Belarusian regime does not seem as odious as it once did. The country’s willingness to oppose Russia has worked to partially soften Lukashenko’s image as “Europe’s last dictator” – partially by shifting issues like human rights and European values to the backburner. As the geopolitical crisis worsens, discussions over values do not seem as important as maintaining stability in such an important region as the zone between Europe, Russia, Ukraine and the Baltics. Absolutely no one needs a Maidan in Minsk. It would be a stretch to say that Minsk has already reaped any serious dividends, but the climate surrounding it is improving somewhat, and officials are anxious to take advantage of the situation to begin a thaw in Belarusian-Western relations. Belarus will have its next presidential election in 2015. There is no question what the results will be, but the Belarusian authorities have already made it their goal to legitimize the election in the eyes of the global community. If the authorities manage to come to an agreement with the opposition – or at least a fraction of it – to recognize the elections (in exchange for several spots in parliament, say), it may be possible for Belarus to strike some new agreements with the West. But regardless, Belarusian opposition politicians have about as much chance of having a real say in how the country is governed as they do of winning the presidency. However, Belarus may reap some benefits from personnel changes in the Polish Foreign Ministry and in Brussels. At a minimum, the departure of European Commissioner for Enlargement and European Neighborhood Policy Stefan Fule and of Polish Foreign Minister Radoslaw Sikorski gives Belarus hope for a slightly more positive dynamic in its relationship with Europe – possibly even a lifting of the long-standing sanctions against Minsk. Of course, there is an extremely limited possibility of this actually happening. The strained relations between Belarus and the European Union go beyond the reputation of the president, and despite propaganda claims to the contrary, Belarus is obviously a close ally to Russia in the region – and a strategic one, at that. 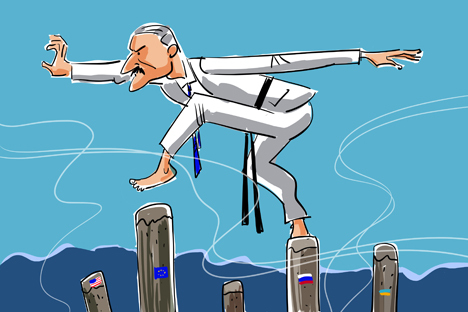 Belarusian-Western relations are unlikely to undergo any fundamental changes, although Lukashenko will certainly try to benefit as much as possible from the ongoing events. He has never been equaled in these types of games. Alexander Iskandaryan is a political scientist and director of the Caucasus Institute in Yerevan, Armenia.